Remaining a leader in the titanium aerospace market requires continuous improvement to meet customer demands for service, quality, delivery and cost. For manufacturers to thrive in this market, it is critical for them to steadfastly pursue the best people, processes and technologies. Careful management and integration of these attributes is the key to securing a long-term position within OEM supply chains. “Aircraft OEMs are looking for ways to simplify their supply chain. They want to work with high-performing, vertically integrated suppliers. Our combination of materials expertise and advanced manufacturing capabilities positions us to succeed in meeting those demands,” said Christian Ouimet, managing director of Alcoa’s facility in Laval, Quebec, Canada. A global leader in lightweight metals technology, engineering and manufacturing, Alcoa innovates multi-material solutions that advance the world. The company purchased the Laval manufacturing facility in 2015 as part of its acquisition of RTI International Metals. With RTI, Alcoa expanded its reach into titanium—the world’s fastest-growing aerospace metal—and added advanced technologies and materials capabilities for greater innovation power in aerospace and beyond. High-velocity machining at the Laval facility is one example of how Alcoa’s downstream manufacturing processes enable Alcoa’s businesses to produce some of the largest, most complex and finished aerospace components without having to outsource any part of the process. And that makes customers’ lives simpler and saves costs. 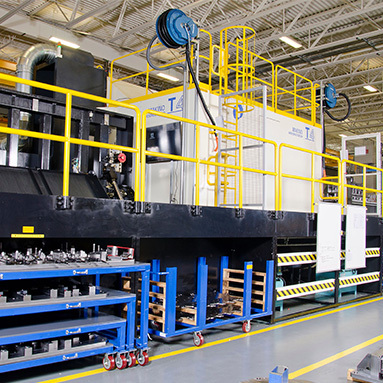 Prior to titanium-engineered products, ATEP Laval specialized in large aluminum aircraft structural components with investments in several Makino MAG-Series machines. To meet customers’ demand for continuous costs reductions, ATEP Laval continuously optimizes process through new tooling and real-time machine process monitoring. 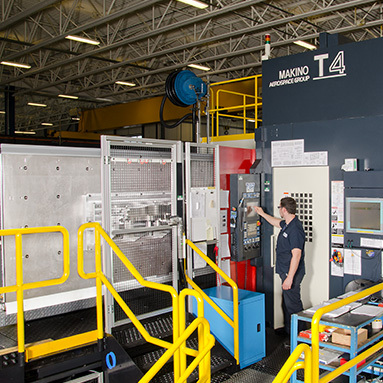 ATEP Laval’s acquisition of Makino T-Series machines have enabled the company to reduce cycle times by more than 60 percent while simultaneously reducing tool costs by 30 percent or more. With the T2 and T4 machines, ATEP Laval is able to perform shorter runs between large batches, reducing on-hand inventory requirements and driving down costs. Featured from left to right: Christian Ouimet, managing director of machining and integrated structures operations; Patrick Deschenes, CNC programmer; Christian Perry, CNC programmer team leader, technical services. 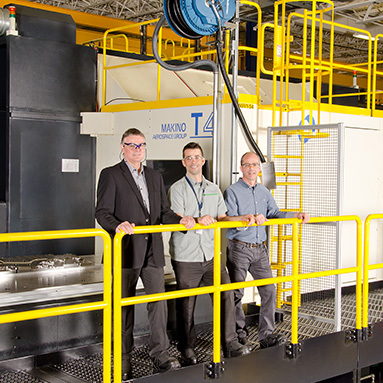 When evaluating its first T4 investment, ATEP Laval engineers performed collaborative testing with Makino engineers to develop a process that was nearly three times faster than prior methods. The Laval facility is part of the company’s Alcoa Titanium & Engineered Products (ATEP) business unit, which supplies advanced titanium and other specialty metals, products and services to the commercial aerospace, defense, and oil and gas markets. Alcoa’s aerospace businesses, including ATEP Laval, will form part of the value-add company, to be named Arconic, following Alcoa’s separation in the second half of 2016. Arconic will be a premier innovator of high-performance, multi-material products and solutions in attractive growth markets, including aerospace. ATEP Laval specializes in the precision machining and assembly of complex titanium aircraft components, such as seat tracks, body chords, spars, doorframes and wing attachment components, for the likes of Airbus, Boeing and Bombardier. 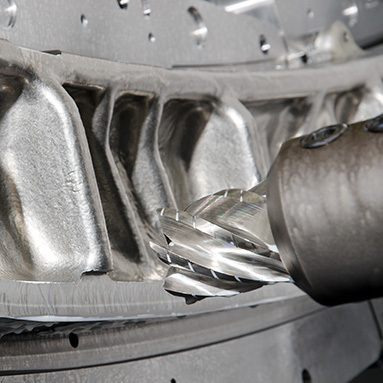 Due to titanium’s unique material properties, it is widely recognized as a material that is challenging to machine cost-effectively. However, ATEP Laval identified titanium-engineered products as a significant growth market. For more than a decade, the facility has been recognized as an established expert in the field. Prior to its strategic pivot toward titanium-engineered products, the Laval facility primarily focused on the machining of large aluminum aircraft structural components. 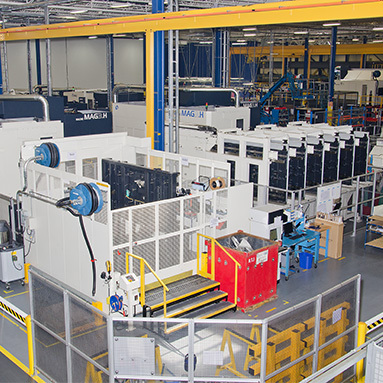 Investments in several Makino MAG-Series machines had been made to mirror the type of aluminum machining technology used by OEMs. So when ATEP Laval began exploring titanium machining technologies, this familiarity with Makino equipment led the company to explore Makino further, in addition to several other machine suppliers. 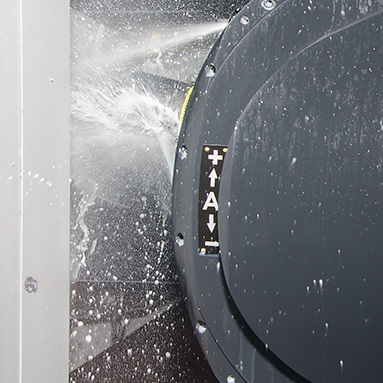 After returning from Japan, ATEP Laval began working with Makino to perform a series of test cuts on the T4 using two of its current production applications. Research engineers from ATEP Laval and Makino worked side by side in Makino’s Mason, Ohio, facility to optimize processing methods and explore the features of the machine. Together, they produced a stable process that was nearly three times faster than the company’s previous methods. ATEP Laval’s selection of machine suppliers involved a close evaluation of full life-cycle costs amortized over the duration of the duration of the contract. Through test-cut results, the company determined that the T4 was the best investment to offset costs while maintaining requirements for quality and delivery. According to Christian Sauvé, vice president and general manager, engineered products, ATEP, the benefits of acquiring a machine that could improve processes and avoid any non-quality costs outweighed the burdens of the long-term investment. “Working closely with Makino’s titanium research and development team gave us confidence in the abilities of the equipment to deliver on the promises of performance that we make to our customers. The test procedures were a good exercise in demonstrating the capabilities of the equipment and gaining a clear return on investment,” Sauvé said. 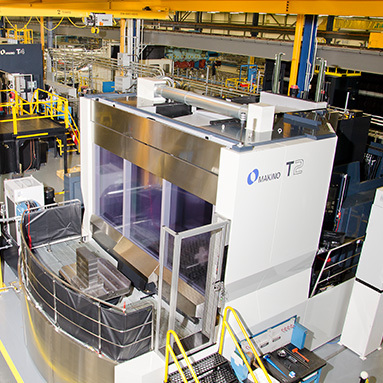 Since its initial T4 acquisition, the Laval facility has expanded its titanium machining investments with a second T4 and the smaller T2 model. The company is also currently investing in a late-2016 delivery of the first-ever T5 machine to support production of some larger titanium doorframe components. As OEMs seek to simplify their supply chains, Alcoa is well positioned to add value to the supply chain. ATEP Laval is one of Alcoa’s largest and most extensive machining operations. The facility shares knowledge and efficiencies with other Alcoa facilities, enhancing the company’s overall capabilities and enabling Alcoa to conquer the complexities of titanium machining on a global scale. Through decades of transformation, ATEP Laval has built a reputation for superior customer service that continues today and is the foundation for a bright future. Originally founded in Saint-Leonard, Quebec, Canada, as Claro Precision in 1966, ATEP Laval possesses a rich team history in the manufacturing, assembly and finishing of aerospace components. These capabilities expanded in 2004, when RTI International Metals, a leading producer of titanium mill products and fabricated metal components for the global market, acquired the company. As part of RTI, the company set forth on a strategic path to become a leader in advanced titanium and other specialty metals products and services for the commercial aerospace, defense, oil and gas, and medical products markets. The company’s success in these markets brought tremendous growth, including the construction of a new, expanded machining facility in Laval. When Alcoa acquired RTI in 2015, the acquisition expanded Alcoa’s advanced manufacturing technologies and materials capabilities for greater innovation in aerospace and beyond. Laval is part of the company’s Alcoa Titanium & Engineered Products (ATEP) business unit. It is one of five ATEP facilities across three countries providing expertise in machining and extrusions. This combination of extrusions know-how and machining expertise has helped deliver solutions that reduce cost and lead-time for Alcoa’s customers. Today, ATEP Laval carries forward its tradition of excellence, combining the ingenuity of its people with cutting-edge, advanced manufacturing to deliver quality, highly engineered products that ensure customer success. The 180,000-square-foot facility and its 290-plus team members were named an Alcoa “Machining Center of Excellence” for exceptional performance in the precision-machining and assembly of titanium, aluminum and other specialty metals parts and components, and for providing machining expertise and support to other business units. Components produced at ATEP Laval fly on the world’s most advanced aerospace platforms, including the Boeing 787, Airbus A350 and Bombardier C Series. Alcoa is on track to separate into two industry-leading, publicly traded companies in the second half of 2016. The upstream company will operate under the Alcoa name; and Alcoa’s aerospace businesses, which include ATEP Laval, will form part of the value-add company, to be called Arconic. Arconic will be a premier innovator of high-performance, multi-material products and solutions in attractive growth markets, including aerospace.